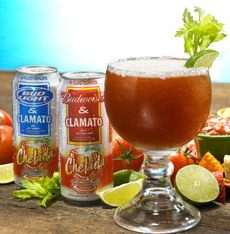 Anheuser-Busch has taken its Budweiser & Clamato Chelada and Bud Light & Clamato Chelada national. A-B successfully tested the products in several markets, following the heals of the spectacular success of Miller Chill. The drinks blend Bud and Bud Light with Clamato Tomato Cocktail, made by Cadbury Schweppes Americas Beverages (CSAB). I guess I live in one of the test markets. I tried one of these and they are pretty bad. You cannot beat a real michelada made at alot of the local bars and restaurants. Its by default made with a Mexican beer, usually Dos Equis lager. There is just way too much Clamato in these things. I’ve made tons of Caesars with clamato and vodka (people like them better than bloody marys until you tell them it has clamato in it) but I’ve never had one of these Cheladas. I’ll try it but I doubt it will be as good as one of my Caesars. Maybe it’s just a local thing but here we make “red beers” either tomato juice and beer or clamato and beer, and have been making them for, oh I don’t know maybe at least 40 years. Now suprise a big mega brewer finds out about it and uses thier swill and clamato and cans it. Please do yourself a favor thake about 6 oz. of tomato juice or clamato, v8 also is good, add 6 oz of a good pils or pale ale, a few drops of hot sauce and 3 green olives, mix gently and drink. Repeat as necessary. You can adjust the recipe to your hearts content I like more beer in mine, my wife like more juice. Hey she’s from the sticks what can I say.I was shocked that everone in the U.S. didn’t know about these we were in Florida six years ago and had to teach bartenders how to make them. I don’t know it sounds pretty bad to me. We go down to Mexico quite often (San Felipe, Baja) and enjoy freshly made “Chebelas” (scooner glass, draft Mexican Beer, lime, Tabasco, clamato, spicy rim coating). At home we try other variations (adding Worcestershire sause) and find them quite pleasing and refreshing. We spied these Bud products on the test market shelf and thought we struck the Mother Load. We bought all the Bud Light versions we could. We take them to parties, picnics, etc and they are very well received. I freaking love this stuff!!!!!!!!! !